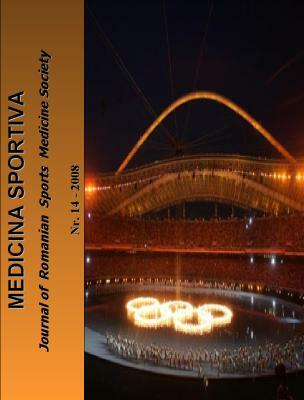 Medicina Sportiva, a publication of Romanian Sports Medicine Society, is a quarterly, peer reviewed journal which publishes original research, reviews and case reports on all areas of sports medicine and exercise science (exercise physiology, sports biomechanics, sports biochemistry, sports nutrition, diseases and exercise, sports injuries and sports traumatology, kinesiology and kinetotherapy). All manuscripts must be submitted in English. Manuscripts are considered if they are submitted only to Medicina Sportiva and therefore should not be under consideration for publication elsewhere, either in part or in whole. Only the authors are responsible for the scientific context and legal aspects of the articles. Reviews include theoretical and practical aspects that must to be report to actual researches in sport medicine. Size: the article must to have no more then 12 pages. Format: the text must to be compact and can have a few subtitles. Original papers include fundamentals research and clinical research regarding diagnostic and treatment. Size: 8-10 pages, 4-5 imagining documents (graphics, images, etc.). Format: the text must to be structure in introduction (present stage of the research), aim and scope of study, material and method, results, discussion, conclusions (must to present personal conclusions). Case reports include specific clinical cases that provide relevant information on diagnosis and therapy of a particular case that proves unique to clinical sports medicine. Content: clinical aspects and researches regarding morphologic evaluation and clinic assessment, therapeutic conclusions and evolution. Size: 3-5pages, 1-2 original demonstrations and researches. Format: case report, discussion and comparative study in report with actualities studies. line spacing = single, column = one. Tables, Figures and Schemes are to be typed on separate pages at the end of the manuscript. Ensure that each illustration or table has a caption attached, which should comprise a brief title and a description. Explain all symbols and abbreviations used. Units of measurement, symbols and abbreviations must conform to international standards. Do not imbed figures or tables into the text. The tables, figures and schemes must be in the final published size, not oversized. Illustrations and tables that have appeared elsewhere must be accompanied by written permission to reproduce them from the original publishers. This is necessary even if you are an author of the borrowed material. Borrowed material should be acknowledged in the captions in the exact wording required by the copyright holder. If not specified, use this style: “Reproduced by kind permission of . . . (publishers) from . . . (reference)”. Identifiable clinical photographs must be accompanied by written permission from the patient. The first time an abbreviation appears in the text, it should be preceded by the words for which it stands. Title: should be simple, concise and informative. Capitalize the first word only. Author names should appear as used for conventional publication, with first and middle names or initials followed by surname. If multiple authors have the same affiliation, one listing of the affiliation should be used, preceded by the full list of those authors on the line above. Key words. Immediately after the abstract, provide a maximum of 3–6 keywords. Key words should refer to the terms from Medical Subject Headings (MeSH) of MEDLINE/PubMed. Acknowledgments: Acknowledgments should be included before the References section. References: in the text identify references by Arabic numeral in brackets, using Oxford system. The list of references should include only those publications witch are cited in the text. References should be presented in consecutive order as they are cited in the text. References should be cited in the text by placing sequential numbers in brackets (for example, (1), (3-5)). The four six authors should be presented. No more than 30 references will be accepted. b) Books: name of authors, years of publish in brackets, title of papers or capitol, title of book or monograph (italic), editors, city, pages (Booth FW, Baldwin KM (1995). Muscle plasticity: energy demanding and supply processes. In: Handbook of physiology. Rowell LB, Shepherd JT (eds). Oxford University Press, New York, pp 1076-1121). Corresponding author should contain all information necessary for an effective correspondence (postal addresses, e-mail, fax and telephone number). It must include a brief biography, approximately 70 words per author, for each author including academic title/degrees, institution affiliation, research focus, e-mail address. Research carried out on humans must be in compliance with the Helsinki Declaration, adopted by the 18th World Medical Assembly, Helsinki, Finland, June 1964 and any experimental research on animals must follow internationally recognized guidelines. approved by the appropriate ethical committees related to the institution(s) in which it was performed and that subjects gave informed consent to the work. Studies involving experiments with animals must state that their care was in accordance with institution guidelines. Patients' and volunteers' names, initials, and hospital numbers should not be used. In a case report, the subject's written consent should be provided. It is the author's responsibility to ensure all appropriate consents have been obtained. Patients have a right to privacy. Therefore identifying information, including patients images, names, initials, or hospital numbers, should not be included in videos, recordings, written descriptions, photographs, and pedigrees unless the information is essential for scientific purposes and you have obtained written informed consent for publication in print and electronic form from the patient (or parent, guardian or next of kin where applicable). If such consent is made subject to any conditions, Universitaria Publisher must be made aware of all such conditions. Written consents must be provided to Universitaria Publisher on request. Even where consent has been given, identifying details should be omitted if they are not essential. If identifying characteristics are altered to protect anonymity, such as in genetic pedigrees, authors should provide assurance that alterations do not distort scientific meaning and editors should so note. If such consent has not been obtained, personal details of patients included in any part of the paper and in any supplementary materials (including all illustrations and videos) must be removed before submission. Manuscripts are welcomed from all countries, and may be submitted for consideration on the understanding that they have not been previously published elsewhere, either in print or electronically, and that they are not under consideration by any other publisher. Authors wishing to include figures or text passages that have already been published elsewhere are required to obtain permission from the copyright holder(s) and to include evidence that such permission has been granted when submitting their papers. Authors are required to ensure that no material submitted as part of a manuscript infringes existing copyrights, or the rights of a third party. The author who submits the manuscript for publication should ensure that all coauthors are included on the paper, and that all coauthors have seen the final version of the article and have agreed to its submission for publication. Any material received without such evidence will be assumed to originate from the authors. The authors are responsible for obtaining permission from copyright holders for reproducing any illustrations, tables, figures or lengthy quotations previously published elsewhere. Articles published in Medicina Sportiva may not be published elsewhere without written permission from the publisher. ATTENTION! The editors of the Journal Medicina Sportiva aren't responsible for the legal aspects of publishing. In the moment of the sending the manuscript to Medicina Sportiva, only the authors of the manuscripts are responsible for the scientific context and legal aspects of publishing the manuscript (copyright, plagiarism, permission from other publishers, authors etc). All papers submitted to Medicina Sportiva are subject to peer review. Manuscripts must not be under simultaneous consideration by any other publication, before or during the peer-review process. Upon receipt of a manuscript the editor will notify the corresponding author that the submission has been received. Received manuscripts are first examined by the Medicina Sportiva editors. Manuscripts with insufficient priority for publication are rejected. Manuscripts not prepared in the advised style will be sent back to authors without scientific review. The manuscript will undergo a blinded review process. Under this process the editor will forward (electronically) the manuscript to two independent reviewers, members of the Scientific Board. The editors encourage authors to suggest the names of potential reviewers, but they reserve the right of final selection. Normally the review process will take approximately 8 weeks. After the review process has been completed the main author will be notified via e-mail either of acceptance, revision or rejection of the manuscript. If revision was recommended, this should be completed and returned to the editor within 2 weeks. Editors may make necessary changes to articles in accordance with guidelines for authors. • prepare other derivative works, to extend the article into book-length form, or to otherwise re-use portions or excerpts in other works, with full acknowledgement of its original publication in the journal. This journal uses a transfer of copyright agreement that requires just the corresponding author to sign on behalf of all authors. The publication, reproduction, modification, display or transmission of any other materials except Journal's articles (including the banners, the logo) contained in the www.medicinasportiva.ro website is allowed solely with the MedicinaSportiva.Ro’s written approval. The User is allowed to copy these other materials solely for his/hers own personal use, excluding any use for advertising, commercial purposes, etc. This website’s information is at the User’s disposal for documentation and acquisition of knowledge, not for commercializing it.